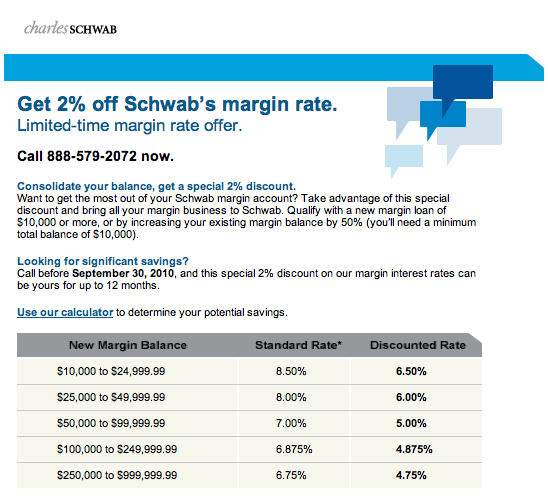 This morning I received an email from Charles Schwab offering to reduce my margin interest by up to 30%, depending on my willingness to borrow. It strikes me as unusual, but also very interesting, because this represents an aggressive attempt to increase lending activity. Perhaps banks are finally realizing that the very steep yield curve gives them a fabulous opportunity to make money by lending more. Their prior reluctance to lend was undoubtedly driven in part by concerns that the economy was fragile and credit risks were high, but those concerns are likely beginning to fade. Once a recovery gets underway, it becomes self-perpetuating as confidence rises and risk-taking resumes. Here is a short editorial from the Washington Examiner titled "United States of Argentina." I reprint it because it does a good job of comparing the worst of what is going on in the US with what those same policies did to Argentina. The parallels between Obamanomics and Peronism are chilling. I know a lot about Argentina, having lived there for four years in the late 1970s. I've been following the economy closely ever since, and have traveled there extensively. This article does not exaggerate in the least how much Argentina has suffered from Big Government. I believe strongly that the US electorate does not want to follow in Argentina's footsteps, even though our current ruling class apparently does. This is going to be the central issue in the upcoming November elections. If we say "NO" to American Peronism, as I think we will, our future will brighten considerably. This chart shows New Orders for U.S. Manufacturers. The chart follows the pattern that characterizes nearly all recoveries: the steeper the recession, the stronger the recovery. The pattern has been confirmed empirically, and it was first conceptualized in 1964 by Milton Friedman as the "Plucking Model" of growth. New orders in the past year are up over 10%, and that marks a faster pace of recovery than the one that followed the relatively mild 2001 recession. Of course we are still well below the previous highs, but a rapid recovery such as we are seeing here and in many other areas of the economy all fit together. Importantly, this is all likely to have a synergistic effect, continuing to push the broad economy higher despite the fierce headwinds of faux-stimulus policies and aggressively accommodative monetary policy. At the very least, the economy wants very much to return to its former level of activity, and to accomplish that requires a lot more growth, more profits, and more jobs; all of which we are likely to see in the next year or so. The ADP employment report released today was a bit softer than the market expected (-23K vs. +40K), but it's within shouting distance of an inflection point in which the jobs market stops shedding jobs and starts adding. Expectations for this Friday's payroll number are for a healthly gain of 180K, but most of this would probably come from the hiring of census workers. Regardless, it's clear that the jobs market is at or near the point at which growth replaces decline. Soon we'll be worrying about how fast the economy is adding jobs. It's still very unlikely that enough jobs will be added between now and the November elections to make the electorate feel like it received good value for the $1 trillion we borrowed to "stimulate" the economy. This could be one of the most exciting, important, and divisive elections in memory. Here's a conundrum: consumer confidence is still at very depressed levels, yet there is no shortage of pundits calling for a double-dip recession and/or another major stock market decline. Market bears cite evidence of overvaluation in stock prices and overbought conditions, while economy bears point to another wave of residential and commercial mortgage defaults, high unemployment, massive deleveraging, trillion-dollar deficits, and rising tax burdens, among other things. A quick look at this chart, however, tells you that consumers are always worried about an economic relapse in the wake of a recession (once burned, twice shy, as the saying goes), but they are never worried about the future in the months just before a recession. I would wager that the same holds true for most pundits. Very low consumer confidence has traditionally been one of the best buy signals for stocks. Why should it be any different now? 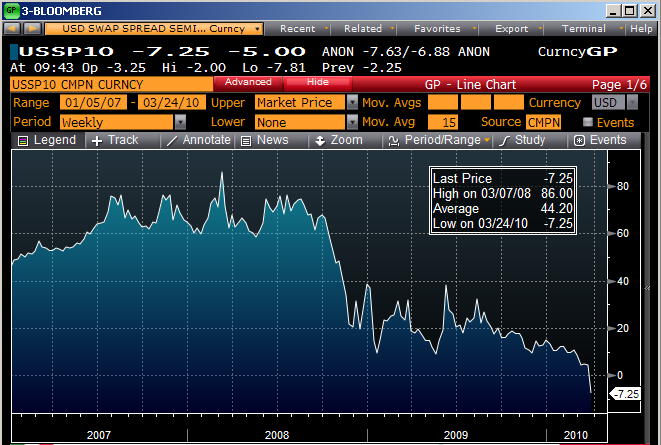 More signs of a V-shaped recovery: industrial metals prices are now up 110% from their late 2008 lows. The global economy must be doing quite well, and accommodative monetary policies from most of the world's central banks are not interfering with the ongoing rise in prices or the expansion of activity. So far I have seen no signs in sensitive asset prices of a slowdown in economic activity anywhere. How much more evidence does the Fed want to see before they take the "daring" step of raising short-term interest rates by a few notches? The evidence continues to suggest that the housing market has stabilized, and may even be improving. The Case Shiller Home Price Index for 20 major metropolitan markets hit bottom in the second quarter of last year and has been rising gradually ever since. Given the lags used in constructing the index, this means that prices likely hit bottom around March of last year. Even after adjusting for inflation, as this chart shows, home prices are up at a 3% annualized rate over the past 8 months. We're now seeing the dimensions of the housing "bubble" with more clarity: in real terms, prices rose about 54% more than they should have, from 2002 through 2006, but now that they have fallen by 35% we have returned to some semblance of normality. Markets have found their new clearing price. Excess home inventories are being rapidly reduced due to an unprecedented decline in new housing starts. Since the rate of new household formation is still way above the current pace of construction, we should expect to see a pretty impressive increase in new construction over the next year or two. This is excellent news all around, but the market still seems very reluctant to buy into the notion that the housing market might actually be improving. In typical bull market fashion, the market continues to climb walls of worry. This is a true story from almost 40 years ago, but it may be subject to some memory lapses and faulty recollections of facts on my part. I tell the story now because I think people need to understand why it is that government is so bad at controlling spending, especially now that spending is so out of control and deficits are approaching unimaginable levels. Background: I was a young LTJG in the Coast Guard from 1972-75, and I was stationed in San Francisco as the Deputy Director of the 12th District Coast Guard Auxiliary. Sometime during that period, I can't remember exactly when, there was a federal budget crisis and the solution was to cut all federal budgets by 10% or so across the board. As it happened, when the 12th District command called a meeting of all division heads to develop a plan to implement this sizeable budget cut, I was the stand-in for my commanding officer because he was out of town. Perhaps it was the Admiral who addressed the meeting, but I can't be sure. Nevertheless, his plan was straightforward. Instead of asking each division head to shoulder their share of the budget cut burden, the plan was to take the entire cut out of the Search and Rescue division's budget, leaving them with almost nothing. As of a certain date, the Coast Guard would suspend all search and rescue operations due to the budget cut. The plan had an unspoken assumption that was explained to those of us present at the meeting: the public hue and cry that would result from such a draconian cut to emergency services would be huge, and it would likely persuade Congress to exempt the Coast Guard from the across-the-board budget cuts. And so it was. The Coast Guard never had to take that 10% cut, even though my budget had plenty of room to cut, and I imagine that many other departments and divisions could have taken a cut as well. From that experience as well as others, I came to understand the difference between the public and the private sector. The private sector is all about survival: if your revenues drop, you have to cut your spending. The public sector is all about politics: your survival and prestige is a function of the size of your budget, so you never consent to a cut. Instead, you always ask for more and more spending authority, no matter what. The bill is full of fatal flaws, as I and many others have emphasized. Mandating the purchase of anything just because you're alive is unconstitutional. Prohibiting insurance companies from refusing policies to those with pre-existing conditions will bankrupt the industry, because the penalties for noncompliance with the purchase mandate will be much less than the cost of insurance. Regulating the price that insurance companies charge, in addition to their profit margins, is also unconstitutional. Perhaps most important of all, the collapse of the Soviet Union proved once and for all that governments are utterly incapable of restructuring and efficiently managing industries, much less economies; it's simply too complex a job for mere mortals. And then there's that old economic maxim that says you can't impose price controls and hand out subsidies in a market without eventually facing the need to ration the product or service in question. The bill, which amounts to the biggest restructuring of the American economy in history—of any economy, for that matter—and which promises to deeply impact the lives of every single one of its 300 million residents, was passed against the will of the people. Not a single vote from the opposition; every major poll prior to its passage showed that a majority of people were against it. Even today, the majority of people believe it should be repealed. Never before has anything this big passed in such an undemocratic, partisan manner. It will almost certainly be a budget buster, at a time when we are already staggering under the burden of $1.5 trillion dollar deficits for as far as the eye can see, and a rapidly rising debt/GDP ratio that will soon take us to the lofty heights previously occupied by such economic titans as Japan and Italy. Never before has a major government program not ended up costing significantly more than projected, and this is one of the biggest to come along. The health care legislation represents a culmination of a sequence of unpopular major initiatives from Washington. First, there was Henry Paulson’s massive transfer of wealth from the people most hurt by the financial crisis to some of the people most responsible for it. Next, came the massive, ill-conceived stimulus bill, which was not timely, targeted, or temporary but instead a pure power grab by Washington. Health care legislation is merely the latest straw. The American people are watching their country being transformed from an exceptional, vibrant free economy to a broken European welfare state, and many of us do not like the direction of change. We may not know exactly what is in the health care legislation (does anyone? ), but we know its intent to assert government authority over health insurance. We know that it creates a large entitlement, paid for in large part by unspecified future cuts in Medicare. Thanks to the projected Medicare cuts, the Congressional Budget Office scores the health care legislation as deficit-reducing relative to current law. However, current law is unsustainable. Medicare spending will have to be cut in the future in order to avoid national bankruptcy. By diverting projected Medicare cuts into a new entitlement, this legislation makes the impending budget crisis in Medicare loom sooner and deeper. The public probably does not understand this budgetary legerdemain, but their instinct is to distrust Congress. In this case, the populist instinct is valid, and the elitist contempt for ordinary citizens is quite unjustified. 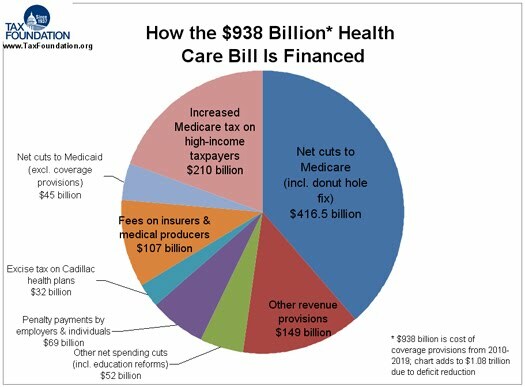 The Tax Foundation has put together a summary of how the healthcare bill is to be financed. Note the huge portion (44%) that is paid for by cutting Medicare spending. How many are gullible enough to think these cuts will actually occur? And won't they just make the Medicare deficit even worse than it already is? There is some really serious, runaway deficit spending lurking inside this bill, and it's way too big and ugly to keep hidden for long. This whole thing is so outrageous that it simply cannot survive. There is plenty of time for the people to look inside this healthcare box of surprises and come away horrified. Spread the word. UPDATE: Here is an excellent paper written by Barnett, Stewart, and Gaziano that makes a very strong case for why the individual mandate is unconstitutional. The next chart shows the behavior of the price indices for services and durable goods since they began to part ways in 1994 (prior to that they both moved only in an upward direction). This price divergence has now grown to sizeable proportions. Put it this way: over the past 16 years, the average price of services has risen almost 60%, while the average price of durable goods has fallen almost 25%. Service sector prices therefore have doubled relative to durable goods prices in just 16 years. You might say we have had a whole lot of inflation in the service sector which has been offset to a significant degree by a lot of deflation in the durable goods sector. That might explain why there is so much disagreement these days about how much inflation there is. It all depends on what sector of the economy you're talking about. I've been worrying about rising inflation for most of the past year, mainly because of the Fed's extremely accommodative monetary policy (e.g., zero interest rates, plus the injection of over $1 trillion of reserves to the banking system in exchange for mortgage-backed securities). My concerns have not been unfounded. When I look at sensitive indicators of the net effect of monetary policy, I see abundant evidence that there is an excess supply of dollars in the world: the dollar is within 5% or so of its all-time lows against other currencies; gold prices have risen from $260 to $1100/oz. ; TIPS 5-yr forward breakeven spreads have risen from almost zero to 2.7%; the Treasury yield curve is as steep as it's ever been; credit spreads have narrowed significantly across the board; and commodity prices are up steeply across the board. Yet as the chart above shows, measured inflation is within the Fed's target zone of 1-2%, as measured by the Personal Consumption deflator (February figures, included in the chart, were just released today). Am I wrong to worry about rising inflation? I must admit that I thought inflation would be higher by now, but then I've never called for anything more than a "gradual rise in inflation," so I'm not off by too much. As Milton Friedman counseled, the lags between monetary policy and inflation are long and variable, so I take some comfort from that and am content to wait longer before throwing in the towel. UPDATE: I would dearly love to be wrong on my rising inflation call. I really hope the Fed will not again make the mistake of keeping interest rates too low for too long, as they did from 2003-2005. Inflation is very unkind to the poor, the innocent, the trusting, and the naive, and it has wreaked havoc in most of the world's economies from time to time. Given the beating the economy is taking from Obama's wanton spending proclivities (which unfortunately greatly overshadow the Bush administration's excesses), higher inflation is the last thing we need right now. Go here to watch a just-released series of videos/guided tours which show Apple's new iPad in action. It's simply amazing. I ordered mine awhile ago and expect to receive it this Saturday. I can't wait! I haven't seen anything this slick, fast, and beautiful in my life. Apple has a real winner here. Watch the iBook video and you'll quickly realize that the iPad makes the Kindle utterly obsolete. As 10-yr Treasury yields work their way slowly higher (first chart), I thought it would be appropriate to revisit the long-term context (second chart). Yields are up almost 200 bps from their lows, but they are still very low by historical standards. To think that yields of 4% or even 5% pose a threat to the economy seems rather farfetched, when you consider that the economy grew strongly in the 1980s despite yields of 8% and higher, and despite yields being significantly higher than inflation. Similarly, it's hard to see how the recent emergence of trillion-and-a-half dollar deficits has had any meaningful upward impact on yields. Yields are primarily driven by inflation, as the third chart shows. Secondarily, yields are driven by growth expectations, since this in turn suggests the direction and level of rates that the Fed seeks to target via the Fed funds rate. For now, yields remain historically low because the market believes that inflation is going to be low for many years (witness TIPS breakeven spreads of 2-2.5%), and the economy is going to be stuck in a "new normal" rut, with growth of 2-2.5% per year and a huge amount of economic "slack." That in turn suggests that the Fed is going to keep short-term interest rates very low for a considerable period (witness Fed funds futures and eurodollar futures which are priced to a 1% funds rate one year from now, and a 2.25% funds rate two years from now). Yields will move higher if these critical assumptions about inflation, growth, and Fed policy are challenged. For example, yields are likely to move higher if economic growth proves stronger than expected, even though stronger growth would reduce the deficit. I suspect we'll find many more such errors, omissions, and oversights in the legislation passed. I can only begin to imagine the unintended consequences of this legislation that are likely to arise in the future. It's a great reminder that governments cannot run industries, much less economies. Even the smartest of bureaucrats and politicians have only a fraction of the intelligence of free markets. I continue to believe that the defects of this legislation are so massive and pervasive that it will never see the light of day. This extends my posts of yesterday on the subject of corporate profits. 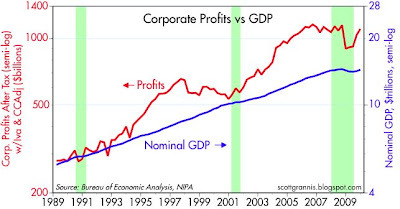 This chart shows total corporate profits alongside profits from nonfinancial business corporations. Note that the two vertical scales are proportionately calibrated, with nonfinancial domestic profits just about half of total profits. The chart should make it clear that financial sector profits (and losses) have not greatly distorted the total profits picture on balance. It's interesting to note the huge decline in nonfinancial domestic profits in the wake of the relatively mild 2001 recession, and the far milder drop in those profits during the much more severe 2008-09 recession. I don't have a good explanation for that, but would welcome suggestions. The above chart compares NIPA profits (total after-tax economic profits of U.S. corporations) with reported operating profits of major corporations. Note how much more stable NIPA profits are than operating profits. I also detect a tendency for NIPA profits to lead operating profits. One reason for that, of course, is that the operating profits ratio is based on trailing four-quarter profits, whereas NIPA profits represent a seasonally-adjusted annual rate for each quarter. We could see some pretty impressive performance in this series over the next year as operating profits catch up to the stronger NIPA profits. Credit spreads are very important indicators to watch, so once again here is an updated version of generic credit default swaps. Spreads continue to slowly tighten, which is good, but they remain significantly higher than they were before the subprime crisis exploded. The bond market is still very cautious (and that is consistent with my take on equity valuation), and it's obvious we aren't completely out of the woods yet. But we are making progress, and that's what's important. This post expands on the previous post. The chart above uses the normalized value of the S&P 500 index as the "P" and after-tax corporate profits from the National Income and Products Accounts as the "E", in order to calculate a PE ratio. In the previous post, I was examining equity valuations using a combination of profits, current equity prices, and interest rates. 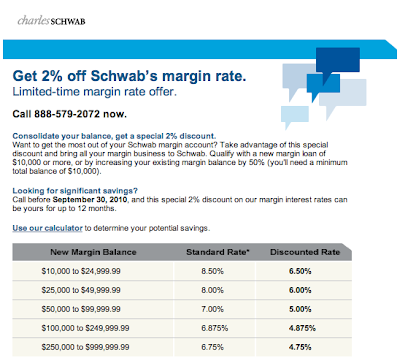 In this post, I leave out interest rates; that makes the degree of undervaluation much less, but it ends up telling the same story. Note that this very simple model of equity valuation correctly identified how cheap stocks were throughout the 1980-1998 period, and correctly flagged the grievous overvaluation of stocks in 2000. With today's final revision to fourth quarter GDP we also received information on corporate profits, and they were strong. 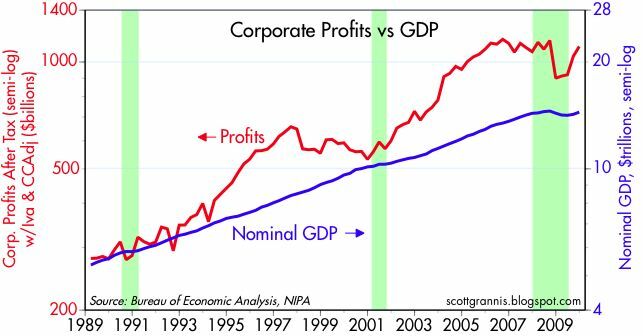 The top chart compares the true economic profits of all U.S. corporations (after tax, and with adjustments for inventory valuation and capital consumption) to nominal GDP. 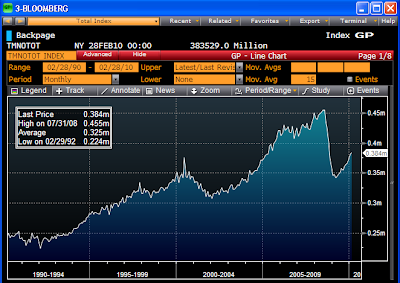 Note that profits doubled from 1998 to 2009, yet the S&P 500 index today is still lower than it was at the end of 1998. The second chart shows profits as a percent of GDP; note that profits by this measure have almost recovered all the losses that occurred in late 2008. By any standard, the corporate profits picture is very bright. The third chart is my variation on Art Laffer's equity valuation model, which in turn is a variation on the "Fed Model" of corporate valuation. It uses the after-tax corporate profits measure from the top chart and capitalizes it using the 10-year Treasury yield, and compares that to the market's actual capitalization using a normalized S&P 500 index as a proxy. By this measure, equities continue to be extremely undervalued. Another way of looking at this is that the market is discounting current profits using an 8% 10-yr Treasury yield, or a 50% drop in corporate profits from here. Simply put, according to this model the market is priced to some very awful assumptions. The last chart simply extends the time horizon of the third chart, to encompass all the available data on this measure of corporate profits. If nothing else, it shows that capitalized profits and market cap track each other quite closely over a very long period. The model revealed that the market was significantly overpriced in 2000, and it has been pointing to a gigantic undervaluation of the market since late 2008. I would expect the current undervaluation to shrink by way of rising Treasury yields and rising equity prices. Leaving profits constant, the red and blue line in this last chart could close their gap with, for example, 10-yr yields at 5.5% and the S&P 500 up 50% from current levels. Both sound reasonable to me. From today's money supply data, we see that M2 has grown only 0.9% in the past year. Since 1960 at least, M2 growth was only lower than this in late 1994 and early 1995. Is this a cause for concern, or a portent of deflation? Not necessarily. Recall that in early 1995, almost at precisely the same time that M2 growth approached zero, the stock market began a powerful rally that lasted through early 2000. As I've discussed several times before, slow money growth that comes on the heels of unusually fast money growth typically reflects a decline in the demand for money, not a tightening of monetary policy. This decline in money demand goes hand in hand with a recovery in confidence and with a recovering economy. People tend to accumulate money balances when uncertainty is high, then spend the money as uncertainty is gradually replaced by confidence and eventually optimism. I think this is one of those times. So rather than fear slow money growth, we should welcome it as a sign that people are again deciding to put their money to work, rather than hoarding it. By spending their M2 balances, the public is helping to get the economy back on its feet, and at the same time minimizing the risk of deflation. UPDATE: Mark Perry and I have been having a friendly back-and-forth over the issue of whether my call for rising inflation is consistent with the pronounced slowdown in M2 growth shown in the above chart. As partial support for my view, I submit the following chart, which simply compares M2 growth and growth in the consumer price index. I would note that the two lines display a substantial degree of negative correlation, which is to say that inflation has a tendency to rise as money growth declines, and vice versa. I think this is consistent with what I have described above, namely, that changes in M2 growth reflect changes in money demand, and this can have important implications for economic growth and inflation. You can see his latest commentary on M2 growth here. Very interesting that "Of those offering a response, 86 percent said something negative while just 4 percent gave a positive one-word description." Even harsher words come to my mind. At 3.91% as I write this, the yield on 10-year Treasury bonds is only 4 bps lower than its 2009 high which was recorded last June. That high, in turn, occurred about the time that the market began to sense that the economy was emerging from the recession that began in early 2008. I continue to believe that yields on the 10-yr T-bond serve as an excellent gauge of the market's expectations for growth in the U.S. economy. It looks to me like the economy is capable of 3-4% growth, so if the evidence continues to accumulate in support of that, I would fully expect 10-yr yields to rise towards 4.5% or higher. This will not be cause for alarm, it will be simply a confirmation of improved growth expectations, and as such should pose no risk to the stock market. To further the discussion on commodity prices, this chart is the inflation-adjusted version of the chart I posted yesterday. Note that the monetary policy regime (which typically alternates between easy and tight) has a significant impact on the behavior of real commodity prices. Easy money not only facilitates commodity speculation using borrowed money, but it also shifts people's preference in favor of tangible assets versus financial assets. In an easy-money world, physical things (real estate, commodities, buildings, structures, offices) become more attractive than financial assets. We tend to build more things when money is easy, and those things require commodities. They become more attractive because their prices tend to rise—tangible assets hold their value (or maybe even make money) when inflation rises, whereas financial assets tend to suffer during inflation because inflation pushes interest rates up, and that depresses the value of financial assets. Gold is the tangible asset par excellence, because it has proven to hold its value relative to other things over very long periods. But it too can exhibit exaggerated swings as monetary policy alternatives between easy and tight. In addition, in my experience, gold tends to lead other commodities. So when money is easy, as it is has been and is now, people naturally tend to prefer to buy things instead of financial assets. Stocks have gone up over the past year (about 75% in nominal terms, but only 50% in terms of gold) but they are still very depressed relative to gold from an historical perspective, as the next two charts show. When monetary policy shifts away from its current extremely accommodative posture, as it must at some point, expect gold to decline and stocks to continue to rise. After some setbacks in January and February which led the market to question the durability of the recovery that started last summer, unemployment claims have resumed their downtrend. The recovery is still underway, even though progress on the labor front remains painfully slow. Markets have been climbing walls of worry, and each worry—such as the January upturn in claims—has been resolved satisfactorily, allowing equity prices to march slowly higher. Expect this process to continue. The recovery in equity prices is based primarily on mounting evidence that the economy's recovery is genuine, albeit less than dramatic. I keep coming back to this chart, which I have shown many times since Nov. '08, because it has done such a good job of explaining both the origins of the great financial panic of '08 and the mechanism for recovery. The whole mess got started because the world feared the collapse of the global banking system. Fear, panic, doubt, uncertainty—all the things that drive the Vix index—spiked to epic levels, and as a result, spending and investment ground to a halt. Then came the Obama panic of early '09, when he called for a trillion dollars of faux-stimulus spending and trillion-dollar deficits for as far as the eye could see, which in turn deflated markets as they contemplated a massive increase in future tax burdens. As the financial markets gradually healed themselves, with help from the Federal Reserve's (belated) decision to provide essentially unlimited amounts of liquidity to the system, the fears started to dissipate, the spending began to restart, the global economy began to make a comeback, and the price of risky assets began to rise. Although this recovery process has been underway for almost 17 months, we have still not fully recovered, and we are still living under the threat of out-of-control federal spending and its eventual consequences. But we are making progress, and the progress should continue, especially if the electorate in November expresses a strong desire to return to fiscal discipline, as I think it will. I post this at the request of a reader curious to compare the performance of commodity prices and real estate prices in the inflationary 1970s. It should be no surprise to learn that both increased tremendously during that time. Also of interest should be the period from 1980-2004, when commodities were in a flat trend and inflation was low. This is a follow-up to my previous post. Yields on T-bond have jumped about 15 bps in the past several days, in concert with the plunge in swap spreads (the 10-yr swap spread is now down to -9 bps, and has fallen 13 bps since last Friday). This adds weight to the argument that negative swap spreads reflect a decline in demand for Treasuries due to the perception of increased default risk. I might add that since negative swap rates mean that high-quality corporate yields are now lower than Treasury yields of comparable maturity, this is consistent with the view that the outlook for the economy is improving (because corporate profits are strong and the market's estimate of corporate default risk is down). Why this should suddenly be the case, however, I don't know. Sure, the healthcare bill will swell the deficit by a huge amount. But we've known for a long time that the federal deficit was going to be gargantuan, and federal unfunded liabilities are ginormous. I suspect that the imminent end of the Fed's plan to purchase $1.25 trillion of MBS may have something to do with this, but I'm not sure. But no matter what, the message here is that the market has taken a sudden dislike to Treasuries. And to put it in context, swap spreads have been declining for more than a year. The first phase of this decline was virtuous, since it reflected a return to health for financial markets, which in turn foreshadowed a recovery. But the latest part of the decline has become troubling, since it reflects a loss of confidence in the creditworthiness of the U.S.
Could this be the bond market vigilantes' way of dissing the passage of Obamacare? Capital goods orders—a good proxy for business investment—rose 1.1% in February, and are up at an annualized rate of 13.4% since their low of last April. 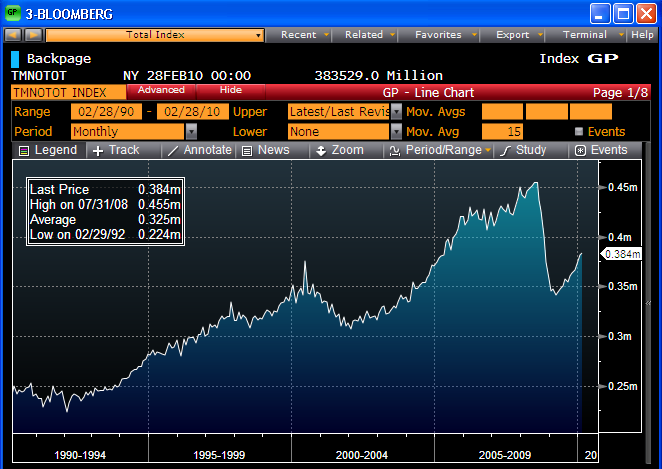 As the chart shows, capex is rising at a faster rate in this recovery than it did following the 2001 recession. Business investment is still very depressed, as are a lot of things, but activity seems to be coming back on line at a faster-than-normal clip these days. That's exactly the way the economy should be behaving, according to Milton Friedman's Plucking Model of growth: the deeper the recession, the faster the recovery. Durable goods orders—a broader classification which includes capital goods plus orders for aircraft and defense-related goods—were also up in February, and have risen at an annualized rate of 13.8% since last April. Both measures reflect a relatively strong investment climate, and, by inference, a reassuring rise in business confidence. All augur well for future growth. The last time I featured this chart was Aug. '09. It's a relatively obscure measure of shipping costs, but it focuses on the North Atlantic, and it compares current shipping rates to the total operating cost of running a ship, including return on equity. Complete info can be found here. For the past year it has contradicted the Baltic shipping index, which has soared. Last August I thought that it had bottomed. As this chart shows (if you have a magnifying glass), I was a little early on my call, but now it does indeed look like it bottomed late last December. Optimists will view this chart as one more (belated) confirmation that global economic activity is turning up. Pessimists will say that shipping rates are still extremely depressed. I don't know enough about this to take a strong stand, but I take heart from the evidence of positive change on the margin, especially since that fits well with a lot of other indicators of expanding global economic activity (e.g., rising commodity and energy prices, rising equity valuations, declining credit spreads). Commodity prices continue to rise. 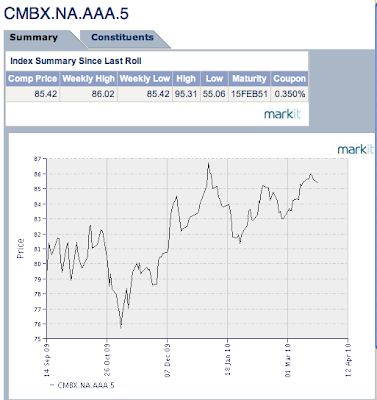 This measure, the CRB Raw Industrials Price Index, is now only 4% below its all-time high, which was set in May '08. Note that this index contains no energy prices, and its components (see the bottom part of the chart) are not commodities typically subject to speculative activity, since they are not traded on futures markets. Are the Chinese hoarding hides? Tallow? Wool Tops? Resin? I seriously doubt it. These prices are up because the global economy is growing, demand is strong, and monetary policy is accommodative. Accommodative monetary policy does just that: it accommodates increases in sensitive prices such as these. The message here bears repeating: deflation is not happening. Deflation is when almost all prices decline. Here we have a basket of industrial commodity prices that have risen 136% from their Nov. '01 lows, or almost 11% per year on average, and they have risen some 60% since the lows of late '08. This, during a time when conventional wisdom (including the inflation models favored by the Fed) has consistently viewed deflation as a major threat, primarily because the economy has been operating with a significant degree of "resource slack." Somebody forgot to tell the commodities market that surging prices were not supposed to be happening. My takeaway from commodity prices: the risk of deflation is minimal; inflation risk is rising; and the outlook for the economy is much better than the "new normal" crowd would have you believe. And I say that even as I lament the passage of the healthcare bill, which means more government control over the economy, less efficiency, and lower average standards of living than we could have enjoyed if a free market approach to healthcare reform had been used. Existing home sales declined last February, and in the two preceding months, but the news continues to be good. Recent weakness is best seen as "payback" for the burst of sales leading up to November, when people were rushing to take advantage of a government tax credit thought to be expiring. The average number of sales over the past year is still well above the lows of early last year, and the lows of early 2008. Considering that housing prices likely bottomed about a year ago, and that lumber prices have almost doubled in the past year, the evidence that the housing market has stabilized (and is probably turning up, albeit slowly) continues to accumulate. With the release of the January value of Moody's index of commercial real estate prices, we see that prices have increased three months in a row. This looks like a bottom, but it may still be early to call one. Nevertheless, it is encouraging to note that both residential and commercial real estate values have fallen by a similar order of magnitude since their recent highs, and both appear to have hit bottom. It would not be unusual at all for a bottom in prices to occur given a) the degree to which prices have fallen, b) the length of time prices have been weak, c) the emergence of a general economic recovery, d) the presence of extraordinarily accommodative monetary policy for the past 18 months. 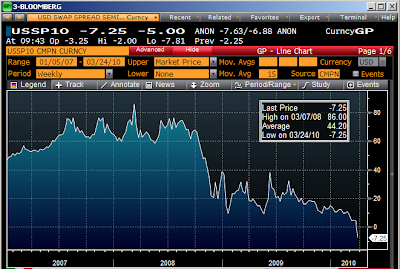 and e) the fact that mortgage rates are at or very close to all-time lows. Indeed, if these markets couldn't find a bottom given all of the above conditions, then it would really be time to start worrying. I've been showing this chart off and on for the past year, with an extensive post on the subject last December, which by the way deserves re-reading. What's noteworthy now is the breakdown in the strong negative correlation (~0.95) between the dollar and equities that persisted from Sep. 2008 through Nov. '09. While most pundits viewed the negative correlation as symptomatic of the "carry trade," I thought it had a lot to do with the demand for money. The dollar was on the receiving end of the flight to safety that was precipitated by the financial crisis of '08, and the reversal of that move is what pushed the dollar down and equities up. Dollars that were hoarded in late '08 and early '09 were subsequently released back into circulation, and this helped spark a recovery both here and abroad. A weaker dollar and a stronger economy thus went hand in hand. What we've seen since last December is a stronger dollar and a stronger equity market. (Note that the chart plots the dollar on an inverted scale.) As I said back in December, this suggests that the economy is improving on its own merits. What's good for the economy is also good for the dollar. People were very scared a year ago, but that fear has been slowly waning for many months; as fear subsides, the price of risky assets rises, and spending and economic activity improve as well. A stronger economy improves the valuation of the dollar, because a) it improves the expected returns on equities, and b) it means the Fed is less likely to be too easy for too long. Parenthetically, a good friend asked me over the weekend why the passage of healthcare is being accompanied by higher equities, when it portends more government control of the economy and higher tax burdens. Shouldn't the market be depressed by the passage of a bill that calls for a gigantic expansion of the role of government in the economy? Here are some possible answers: a) the market doesn't believe the healthcare bill will survive the numerous challenges it faces; b) the huge opposition to the bill which was evidenced around the country and in every public opinion poll is a good sign that the era of Big Government has hit the high-water mark; c) the market is still trading at very depressed levels (as I have argued repeatedly); d) the market's rise over the past year has been driven primarily by the huge change between the market's initial expectations and today's reality (i.e., one year ago the market expected a gigantic depression, and instead we find ourselves in a recovery); and e) the healthcare bill won't translate into meaningful changes in policy or taxes for several years at least, so for now the dominant factor driving the equity market remains the underlying improvement in the economy. If I could summarize all the possible reasons for why the dollar and the equity market have moved higher of late, it would be this: both the dollar and equity valuations remain depressed from an historical perspective, but the dominant changes on the margin have been positive for the economy (a recovery instead of a depression), while the passage and implementation of the healthcare bill is still very much up in the air. "And everybody praised the Duke, Who this great fight did win." "Why that I cannot tell," said he, "But 'twas a famous victory"
-- Robert Southey, "The Battle of Blenheim"
That was the name of the month in the French Revolutionary calendar in which Robespierre fell. To historians, Thermidor denotes any era of waning political ardor. Congressional Democrats will not soon be herded into other self-wounding votes -- e.g., for a cap-and-trade carbon-rationing scheme as baroque as the health legislation. 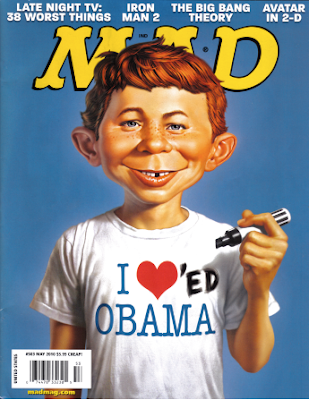 During the Democrats' health-care monomania, the nation benefited from the benign neglect of the rest of their agenda. Now the nation may benefit from the exhaustion of their appetite for more political risk. That's the title of an op-ed by The Washington Examiner published tonight. Despite more than a year of steadily rising public opposition, manifested in opinion polls and in protest rallies across the country, President Obama, Senate Majority Leader Harry Reid and House Speaker Nancy Pelosi finally rammed through Obamacare late Sunday when House Democrats gave the bill their imprimatur. The House vote isn’t the end of the national debate on this issue, however, as the Senate still must accept the House changes in the Senate Obamacare bill. Senate Republicans argue that the House reconciliation bill that makes significant changes in the Senate bill violates the Congressional Budget Act of 1974, maintaining that it should be ruled out of order by the Senate parliamentarian for consideration in the upper chamber. That in turn would mean the only bill the president could legally sign would be the original Senate bill, with its massive funding of abortion and the infamous deals used to buy senators’ votes, including the Cornhusker Kickback. At that point, a constitutional crisis of historic magnitude seems inevitable. Never before in American history has a measure of such importance been imposed on the country by the majority party over the unanimous opposition of the minority. A fast-track challenge to Obamacare’s constitutionality will likely reach the Supreme Court in coming months. The justices will have multiple issues to consider, including the unprecedented federal mandate that all individuals buy approved health insurance, the undeniable inequity of the many corrupt bargains used to buy votes for the measure, and the banana republic parliamentary tactics used by the Democratic congressional leadership. Whatever the high court’s decision, it won’t be nearly as unpleasant as the verdict many Democrats will hear from their constituents in November. We have not seen the end of this controversy, not by a long shot. Big Government's days are numbered. If ever there were a reason to believe that politics is shifting to the right, and in a direction more favorable to business, free markets, and individual liberty, it is now. The latest Rasmussen Reports national telephone poll, taken Friday and Saturday nights, shows that 41% of likely voters favor the health care plan. Fifty-four percent (54%) are opposed. These figures have barely budged in recent months. The House is working furiously to pass this major piece of legislation, despite the fact that it is unanimously opposed by Republicans, and opposed by a majority of voters. This is rather astounding, to put it mildly. Should Pelosi & Co., succeed in passing the bill today, it will be immediately challenged on a number of constitutional fronts, and it will undoubtedly be the focus of the November elections if it is not repealed before then. There is no shortage of pundits that predict major Democratic losses in November, whatever the outcome of today's vote. Why are they doing this? Several possibilities: they are out of touch with mainstream America; they are elitists and they know better what is good for us than we do; they are hell-bent on expanding the role of government; there are too many corrupt politicians who will vote for anything if given a sufficiently large bribe in the form of goodies for their constituents; the system is broken; all of the above. The silver lining to this cloud is that healthcare reform will likely prove to be the high-water mark for Big Government. By reducing their debt servicing burdens, households are expressing a strong desire to increase their holdings of money. (Reducing one's debt is equivalent to increasing one's holdings of money, just as increasing one's debt is equivalent to reducing, or shorting, one's exposure to money.) This is the phenomenon that the Fed has been fighting for the past year or so. The increase in money demand on the part of households and businesses has been so huge that the Fed has had to take extraordinary measures to increase money supply, via a massive expansion ($1.25 trillion) of bank reserves. As an objective observer of the goings-on in the economy, I can't find anything in this data or in this chart that paints a worrisome picture for the economy. If the financial crisis of 2008 was brought on by excessive borrowing, we have surely corrected the underlying problem by now. As a contrarian, I would note that with the deleveraging trend so patently obvious, and with the Fed so blatantly accommodative, it is probably not a bad idea to swim upstream and increase one's leverage these days. Which is equivalent to saying that holding cash is such a mainstream strategy—and so minimally remunerative—that it is embarrassing. See my posts over the last year on this same subject here. Allan Meltzer is one of the great living economists. I've been a fan of his ever since he was asked to review the first research paper that I produced for clients of the firm I worked for back in 1981. He wrote an article in the WSJ a few days ago titled "Market Failure or Government Failure." It's short, sweet and to the point: the financial crisis of 2008 was the direct result of misguided government intervention in the market. Last year the New York Times ran several articles about the end of capitalism. Others picked up this meme and reinforced it with claims that greedy bankers and deregulated financial markets had brought the world to the brink of another Great Depression. Then— just in the nick of time—we were allegedly saved by timely, forceful and intelligent government actions. The groundwork was laid for the next phase: more government regulation of financial and economic life. Left out of this narrative is the government's disastrous mortgage and housing policy. Without the policies followed by Fannie Mae and Freddie Mac—and the destructive changes in housing and mortgage policies, like authorizing subprime and Alt-A mortgages for impecunious borrowers—the crisis would not have happened. How can we avoid another crisis? We need to fix the problem of government intervention in the markets. It won't help at all to increase regulation. Regulation often fails either because regulators are better at announcing rules than at enforcing them, or because the regulated circumvent the regulations. Consider the Basel Accord, passed following bank failures in Germany and the U.S. in the 1970s. This was supposed to reduce banking risk by requiring banks to increase capital if they increased holdings of risky assets. But financial markets circumvented it by putting the risky assets off their balance sheets. Unusual? Not at all. In 1991 Congress passed the FDIC Improvement Act, which authorized regulators to close banks before they lost all their capital. Regulators ignored it. Unusual? Not at all. Bernard Madoff, Allen Stanford, AIG—regulation failed in all of these instances. This is because regulation is static, while markets are dynamic. If markets don't circumvent costly regulation at first they will find a way later. The answer is to use regulation to change incentives by making the bankers and their shareholders bear the losses. Beyond some minimum size, Congress should require banks to increase their capital more than in proportion to the increase in their assets. Let the bankers choose their size and asset composition. Trust stockholders' incentives, not regulators' rules. The market is not perfect. It is run by humans who make mistakes. But the same humans run government where they make different, often more costly, mistakes for which the public pays. Capitalists make errors, but left alone, markets punish such errors. Unfortunately there is no one except the voters to punish the irresponsibility of politicians (from both parties) who continue to make costly spending promises that the government will never keep, but for which taxpayers will ultimately pay dearly. The healthcare reform bill being discussed these days is a perfect example of a new government program that will be extraordinarily expensive and inefficient. Voters must rise up and stop this madness. This is a partial response to a reader's post (by DouglasR) that raised a number of issues regarding the proper role of government in our economy. This chart shows total government spending (federal, state and local) as a % of GDP. It is thus a good measure of the "size" of government, since it tells us how much of the economy's total spending is managed or controlled by government. Note that just over 100 years ago, government represented only 8% of the economy, and now it has reached just over 40%. I think this is an alarming number. When I and other fans of limited government urge a reduction in the size and scope of government, we are not talking about going back to 8% that prevailed in 1900. Most of us would be happy with getting government to shrink back to the level of 30% or so that prevailed in the 1950 and 60s. Even that implies that almost one-third of all the money spent in the economy would pass through the hands of government, or that one-third of all the money that is earned is taken (by taxes) by the government. Surely one-third of GDP is not too small a role for government, and many would argue that it is still way too much. Our Founding Fathers, of course, would have been apoplectic at the mere thought that government could one day consume or command one-third of the economy's resources. There is a maxim worthy of repeating here. For every increment in the size and scope of government, there is a corresponding decrease in the liberty of the individual. Government cannot expand without encroaching on individual freedom. With Obamacare we are seeing close up the extent to which the government seeks to control our lives. Mandating that everyone purchase healthcare insurance, deciding how much insurance companies can charge, prohibiting insurance companies from denying coverage, attaching the wages of those who refuse to cooperate, mandating what types of insurance coverage we must purchase; this is all frightening, something that would put us on a slippery slope that has no foreseeable end. What about future growth? I would say that we have achieved the status of the greatest nation the world has ever seen in spite of the growth of our government. I think that if we rolled back the size of goverment just a few decades we could see continued economic expansion that would lift the welfare of all citizens, both here and around the world. I believe that only the private sector is capable of creating new and productive jobs, and new and creative ideas. The private sector is abundantly capable of creating solutions to all kinds of scarcities, should they exist. Silicon, one of the most abundant elements on earth, was only recently harnessed to do the drudgery work of hundreds of millions of workers, who might otherwise be at work switching phone calls, etc., thus freeing up those workers to do countless other things that contribute to the general prosperity. Without computer chips, the internet would be impossible, and the internet itself was an unimaginable concept when I was born. To paraphrase the great Julian Simon, the only scarce resource on our planet is human ingenuity. If government is prevented from smothering productivity, entrepreneurship, and ingenuity, our future can be as bright and as big as our imaginations. We are living in exciting times, especially as the healthcare bill approaches a faux-vote in the House this weekend. Obama has staked his presidency on this bill, and it is an abomination. Every poll I've seen says that the public is clearly against the bill. As this chart shows, 44% of the people "Strongly Disapprove" of the job that Obama is doing. I have to believe that the majority believe that passing this bill using the "deem and pass" strategy is not only wrong but unconstitutional. Obama himself said that this is not the way to govern, but when push comes to shove it looks like he will do anything and contradict himself without qualms. I still don't believe the bill will pass, and even if it does it will be immediately challenged. If it passes it will become the focus of a referendum in the November elections. It's very likely that if this passes, it will be the last major bill that the Democrats pass in a very long time. I think the people are outraged, and the outrage is spreading and building. The expansion of government contained in this this bill is gigantic. The bill will vastly expand the reach and intrusiveness of the IRS, which by the way will only need $10 billion to implement. This is Big Government writ large. It is a crazy quilt of rules and bureaucracies that is nightmarish in scope. It is almost inconceivable that our president would stake his administration, and the Democrats their Party's reputation, on a bill that is so complex and controversial; that they would sell it as a deficit-reduction measure when it obviously will end up costing hundreds of billions more than the CBO is projecting (if not trillions). If there is anything good about this bill, and about Obama's decline in the polls, it is that the people are seeing what Big Government is really about, and it is not pretty. It is becoming scary. I have faith that the American people will not stand for this. I believe we are living in a time of great political change, and it will end up being for the better: for a smaller, less intrusive government. If not now, then we are doomed. But I'm not ready to give up on America, individual liberty, or free markets yet. Are you? Last night I used this presentation when addressing the folks at the OC chapter of NAPM. It's not a standalone presentation, but some of the charts are interesting, and some of the bullet points. I'm not sure this will come across unless you download it first and then run it as a PowerPoint show. I stupidly used an old version of PowerPoint to put this together, and it doesn't do a good job handling my charts and fonts. Next time I'll use Keynote. Let me know if there are problems with this and I'll try something else. If you didn't see it (I didn't), you can read the transcript here. My impression is that Obama came out of this in a very weak position. Kudos to Bret Baier for an excellent interview. Reading this confirms my belief that healthcare reform is a fiasco that is now of the highest order. Blogging has been a bit light today, and probably will be tomorrow, since I am scheduled to deliver a presentation to the Orange County Chapter of the National Association of Purchasing Managers tomorrow evening in Irvine. I'm putting together a nice collection of charts and bullet points, and hope to make them available following the presentation. Expectations were simply abysmal one year ago, but now they have greatly improved. The market expected a deep depression, and instead we got a moderate recovery. But the market's expectations for the future are still very cautious: 2-3% growth, low inflation, and the risk that we get another collapse. Friedman's Plucking Model of growth suggests that given the depth of the recent recession, we should expect very strong growth for the next several years—6% or more per year. From a supply-side perspective this is unlikely, however, given today's rather awful combination of expanding government, a major expected increase in tax burdens, inflationary monetary policy, and protectionist rumblings. Offsetting these negatives, there are many encouraging developments in the economy that reflect a V-shaped recovery. Corporate profits are strong. Swap spreads are back to normal. Capex is strong. Manufacturing is rebounding. Housing looks to have bottomed. Money is abundant. Mortgage rates are very low. The labor market is no longer contracting and is poised to expand. The market is downplaying these positives, however. PE ratios are below average. Credit spreads are at or near recessionary levels. Business investment hasn't increased from where it was 13 years ago. Global industrial production is still way below its 2008 high. PE ratios are below average. Equity prices haven't budged since 1998. The unemployment rate is very high. On balance we should expecte a modest/moderate recovery, with 3-4% growth and a rising inflation trend. Given that the market's outlook is more pessimistic than this, it makes sense to be bullish on equities, corporate & emerging market debt, and commodities. T-bonds and MBS look like the most vulnerable asset classes. The outlook could improve significantly as we get closer to the November elections, since there are likely to be significant and positive changes to fiscal policy that come out of the election. The key to a more bullish outlook is to cut spending, keep taxes low, and tighten monetary policy. This of course runs directly counter to the consensus, which fears that the withdrawal of fiscal and monetary stimulus would doom the economy. On the contrary, I think fiscal and monetary stimulus are part of the problem. The Producer Price Index dropped -0.6% in February, mainly because oil prices fell. Core prices were up 0.1%. Year over year, both are in positive territory; we might say that inflation at the producer level is somewhere between 1% and 5%. I've identified 5 different inflationary periods on the chart, with the annualized rate of inflation noted for each. It begins with the wonderful years in the early 1960s when inflation was basically nonexistent. From '66 through '73 we had inflation that resulted from massive government spending programs that the Fed felt obliged to monetize to some degree. Then from '74 through '82 we had the calamitous inflation that resulted from a massive devaluation of the dollar and a Fed that could never tighten enough. From '83 through '03 we enjoyed relatively low and stable inflation thanks to Volcker's bold monetary tightening in the early '80s, and Greenspan's able stewardship of the Volcker legacy. From '04 on, we've had mostly easy policy from Greenspan and Bernanke. Inflation in the past six years has averaged about twice what it did from '83 through '03, and to judge from the Fed's super-accommodative policy stance, inflation threatens to move even higher. At the very least this chart reminds us that Fed policy does make a difference. It is not unreasonable to expect inflation to be 3% or more in coming years, regardless of how weak the economy is and how much economic slack exists. Bernanke & Co. are stuck in their Phillips Curve rut, much like the Fed was stuck in the 1970s; always thinking that a weak economy would keep easy money from being inflationary. It didn't work then and it's not likely to work now. Very unfortunately for all of us who believe that low and stable inflation is a precondition to prosperity. I'm showing this chart for the umpteenth time in order to emphasize a point I haven't made in quite awhile. The chart shows how tight the relationship between implied volatility (a proxy for the market's level of fear, uncertainty, and doubt) and equity prices has been over the past year. As fear and uncertainty subside, equity prices rise. It makes perfect sense, especially since the crisis that set in starting in mid-2008 was all about widespread fears of a global financial collapse. The point I want to make here, however, is that when the yield on cash is basically zero, and the Fed tells you yet again, as they did today, that cash is going to yield zero for quite some time to come, you have to be consumed by fear, uncertainty and doubt to want to hold on to cash. You have to be extremely, extraordinarily worried that the economy is fragile and likely to suffer a setback; that the housing market is on the verge of another collapse; that the Chinese are going to sell all their bonds and send our yields soaring; that the Fed is going to make a huge inflationary mistake and then have to crush the economy; that Obama and the Democrats in Congress are going to take over the healthcare industry and end up spending trillions more than they are claiming it will cost; that the U.S. government will lose its AAA rating and sink under the weight of many tens of trillions of unfunded liabilities; that no one in Washington, nor any group of concerned citizens in the heartland, will be able to stop this runaway federal government spending train, much less turn it around. If instead you think that there is a glimmer of hope that catastrophe might be averted; that the economy might manage to eke out a moderate recovery with growth rates of 3-4%; that the political winds are now blowing to the center-right instead of the left; that the housing market, after one year of price and construction stability, can manage to avoid another collapse; that the gradual return of confidence will boost consumer spending and lift the animal spirits of businesses just a little bit; that some people out there have enough of a profit motive to figure out how to put at least some of the economy's many idle resources and workers back to work; then you have no reason to hold cash, and every reason to invest in something other than cash. And as investors who currently hold cash gradually come to understand this line of reasoning, the very act of shifting out of cash will add to the economy's upward impetus and become a self-fulfilling prophecy. There are many wise investors who argue that the equity market is overvalued, that it has risen too far, that it's another bubble waiting to pop. I take issue with those concerns, because I see plenty of evidence that tells me the market is still very conservatively priced. T-bond yields of only 3.65% tell me that the bond market has virtually no hope of the economy returning to trend growth in the foreseeable future. MBS spreads at historically tight levels tell me that the bond market has almost no fear that the economy or inflation will surprise to the upside. Credit spreads are still at levels that in the past have been the precursors to a recession. Corporate profits are well above average compared to GDP, yet equity prices haven't budged for over 10 years and P/E ratios are only average. On the whole, I think the level of yields, spreads, and equity valuation is only consistent with a belief that the economy will be very weak for a long time, and that downside risks still outweigh upside risks. So if you are even the slightest bit optimistic, it pays to take some risk these days. And to top it off, that's what the Fed thinks as well, and that's what they are trying to encourage people to do. The Fed's program to purchase $1.25 trillion of MBS will end in a few weeks, but for all intents and purposes, and as far as the market is concerned, it is over. The big question all along has been how much these purchases, which began about one year ago, were distorting the market, and therefore how disruptive the end of the program might be. A quick glance at the top chart here would suggest that the Fed's purchases have played a significant role in bringing down mortgage rates and thereby supporting the housing market; fixed rates on jumbo mortgages have fallen 235 bps since the program was announced on Nov. 25, 2008, and conforming rates have fallen about 125 bps. But since the Fed has only been purchasing conforming MBS, that doesn't explain the outsized decline in jumbo rates, and the huge narrowing of the spread between jumbo and conforming rates. If the Fed were artificially supporting the prices of conforming MBS, then the spread between conforming and jumbos should have widened, not tightened. Spreads on conforming mortgages have fallen to their lowest levels ever, as shown in the second chart. Could this be all due to Fed purchases? I tend to doubt it. If the Fed were artificially supporting the market, then the proximity of the end of the support should have already caused the market to push spreads wider, but there's no sign of that yet. Yes, spreads have widened just a bit in the past several days, but that's no more than just a random blip. I've argued in the past that the end of the Fed MBS purchase program could result in a 30-50 bps widening in MBS spreads. That's still possible, but right now it seems less likely. The explanation for why spreads are so tight is therefore this: spreads are tight because the market expects Treasury yields to be relatively low and stable for a long time, and MBS are therefore very attractive since they offer higher yields with virtually no default risk.